Planning your next dinner party? The smart furniture start-up Kamarq wants to help with their new table featuring an integrated set of next-gen, flat panel speakers. The Japanese company has already started selling the aptly named Sound Table in Japan after a successful Kickstarter campaign and have started a new one to fund global sales. According to its creators, the Sound Table is designed to be comforting, relaxing, and of course, play some tunes. With a minimalistic philosophy in mind, Kamarq wants to ease you into de-cluttering by providing two useful household items: speakers and a table, into one neatly packaged design. There are two versions, a table intended for dining rooms or kitchen areas and a nightstand—both made from white oak or mahogany. 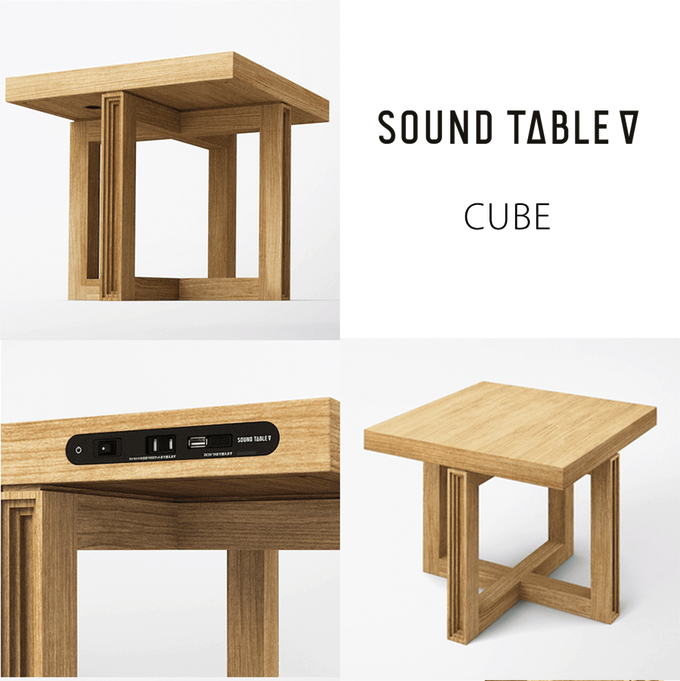 The table is compatible with any smartphone (it comes with is own app) or music playing device via bluetooth. The app allows you to set specific songs to play at certain times of the day automatically. It also comes with 10 “ambient tracks” — just in case you want dine while listening to a soothing waterfall or catch up on some reading to the sounds of a crackling bonfire.